Blooming with a pink flowers that will make anyone day brighter, the Raspberry and Rosy Bouquet is the perfect gift. 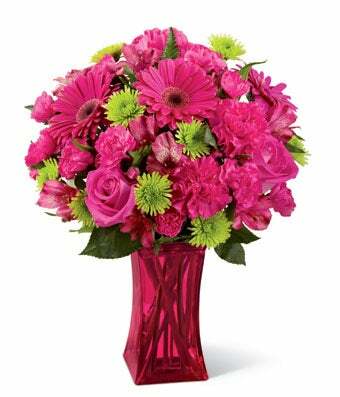 Hand arranged by a florist with hot pink gerbera daisies, pink carnations, pink alstroemeria and green poms. Included with the hot pink flowers, is a fun pink vase.